A wedding is one of the most important days in a couple's lives. Many men may be under the assumption that they are able to get off lightly because of all eyes being directed towards the bride. This is not the case, and the groom’s suit will be the most keenly observed of any they have worn before or will wear after this day. Choosing the perfect suit is essential and the decision you make will need to be a good one, not just for the day but for the photographs that will be viewed by your children and grandchildren for many years to come. Hiring a suit is a lot more common than buying, this is largely because, even though this suit is the most important you wear it is not one that is suitable for other occasions and can really be worn only once. Luckily, for the groom, wedding suit hire is available to match any kind of ceremony. Each one of these suits can be hired in a range of fabrics and colours, and each will give a different look. A lounge suit is the most popular of all suits as it can be worn at a number of different occasions, when choosing this kind of outfit for a wedding you should opt for a more tailored and slim fitting jacket and use accessories to complete the look. The Edwardian suit is all about the coat which is a three-quarter length; it is currently popular at contemporary weddings and is worn with matching trousers and a waistcoat, cravat or tie that complements the dresses of the bride and bridesmaids. 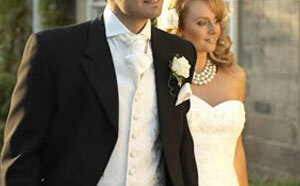 Modern groom wedding suit hire may consist of the morning suit which is perfect for a traditional ceremony. The most popular version of this outfit is the tailcoat which is cut away above waist height at the front with long tails at the rear. This outfit can be finished off with a wing collar shirt, cravat, waistcoat and plain or striped trousers. For the groom, wedding suit hire is a tough decision especially with all the other aspects of planning to worry about. This is why you should get help in making this decision. Visiting a hire shop is a good way to do this as there will be shop assistants that are knowledgeable in fashion and can provide advice on what suit best matches your size, look and skin tone.